I’ve decided to write Simon’s story down because a lot of people have asked me HOW I knew to take him to urgent care and certain details about what happened. I want to write it down to clarify some things, inform others and just to make sure to get it all down in writing before I forget it all, since most details are already slipping away. It’s hard to believe that it’s almost been a year since our family went through this difficult ordeal. It was a pretty normal evening. As we were eating dinner, I mentioned to Jesse that we should give our boys, Liam and Simon, a bath before they went to bed. He stated that I didn’t have to since we had people coming over, but I insisted. Jesse had family in town and we planned on having them over for a game night. As the boys were finishing bathing, my two sisters, Risa and Renata, showed up. They live close by and are at our house a lot. I noticed that there was only one towel; I went to the linen closet in the hallway to get another one as Renata picked Simon, our sixteen-month old, up with the remaining towel, setting him down on the bathroom floor to dry him off. As she adjusted the towel, he stepped forward with his still slightly wet feet and slipped so quickly, he wasn’t able to get his hands out to catch himself. He landed directly on his left side and Jesse was able to hear the crack sound (which we now know was his skull cracking) from the other room. Standing in the hall, I saw his little head hit the tile in the bathroom doorway. Simon immediately started bawling, which is normal for a kid who has just hit his head, plus he tends to be quite dramatic about any injury. I rushed and picked him up to comfort him. I tried to get him to calm down, showing him Elmo videos and asking him if he wanted a piece of candy, anything to try to break the hysterical crying/screaming fit, but he continued constantly for ten minutes. Then he started falling asleep and at this point I started to get worried. Not being one to call 911 or visit the emergency room frequently, I looked to Jesse for what we should do. Since we were expecting guests at any minute, he told me to take him to Kaiser Urgent Care, which closed in the next twenty minutes. Risa drove with me in the back seat to keep Simon awake. Because things happened so quickly and are such a blur, I have no idea as to when/how we put a diaper and clothes on Simon. When we got to urgent care, there was one other person in line in front of me. I bounced Simon on my hip to keep him awake. All of a sudden, he gagged and then threw up all the dinner he had just eaten a mere twenty minutes earlier. As soon as he threw up, I got extremely worried, knowing this was getting more serious as time went on. I started crying. So there I stood, crying, covered in puke, bouncing my child slipping into unconsciousness and trying to get my Kaiser card out to hand to the receptionist with shaky hands. She checked us in and we waited. I walked around the waiting room, frequently taking him outside when he dry heaved twice more, but nothing else was in his little belly. Finally, after about twenty minutes, we finally got to go in. A male nurse in his forties sat with us and asked me various questions about the incident. At this point he told me to let Simon go to sleep stating that “keeping him awake is something you see in movies and if they are going to slip into a coma, they are going to slip into a coma and there’s nothing you can do.” After hearing Simon’s symptoms, he told me that Simon would be okay and passed me on to the physician’s assistant. The PA again listened to Simon’s symptoms and told me that he sounded alright, but that she was concerned since he threw up and wanted to send us to Palomar Hospital for further observations and testing. I commented to her that I was concerned because of the head trauma and would like a CT scan. She agreed, and called an ambulance for us. At this point, Risa drove my car home to Jesse and he joined me at Palomar. On the ride to the hospital. I wasn’t worried about our situation and joked with the paramedics. Simon was awake at this point and sat looking out the back window in a daze. He never smiled or attempted to talk and was very much not his “normal self”. When I look back on this moment, it kills me to think that my son was dying as I laughed with these two gentleman seemingly unconcerned. When we got to Palomar, Simon started crying again, most likely because he was in his car seat, so I picked him up and held him and he quickly fell back asleep. This didn’t concern me too much at the time because by this time it was around 9 pm, which is late and after his bedtime. We waited for a half hour or so in the exam room before they took Simon for his CT scan. We returned to the exam room after the scan and soon after Dr. Hansen came in to discuss the results with us. He stated that he had the results and then was interrupted by a phone call and quickly exited the room. A nurse came in as he left and told us that they were going to move us to another room. I shook my head “no” and quickly sat in a chair. Dr. Hansen came in at that point and told us that the CT scan showed massive bleeding and that Simon would require immediate surgery and that they were sending him down to Rady’s Children’s Hospital because they didn’t have a pediatric neurosurgeon at Palomar. The phone call that he had taken when he came to talk to us earlier had been from Rady’s trying to set up transport for Simon. Being the inquisitive parent that I am, I asked if surgery was absolutely necessary. Dr. Hansen then stated that if Simon didn’t get surgery that it was “unlikely that he’d survive”. As soon as he said this, my body went into full shock. It’s amazing how as much as you want to hold it together, your body doesn’t always comply. In five minutes, Jesse & I made about four trips, individually, to the bathroom. My parents arrived shortly after and we relayed what was going on, although I’m not quite sure we even understood. I remember them telling us that they needed to intubate Simon, in case anything happened during transport. We agreed and they began the procedure. As they did this, Simon woke up a little and I noticed that his left eye was very droopy, almost stroke-like. We waited for a life-flight to arrive, but apparently there was fog, so they proceeded to send an ambulance. 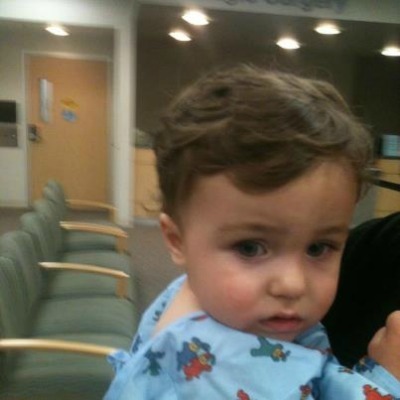 As soon as the ambulance came, Jesse went with Simon and I drove with my mom down to the hospital in San Diego. To be continued Wednesday. Thanks for reading. Reading this brought tears to my eyes! I can’t imagine who scary that was for you guys. I’m so thankful that Mo has healed so well. God is good!!! I don’t know you or SImon but Bea Arnold is a friend of mine and shared this with me when it happened. I prayed so much for your son and your entire family. 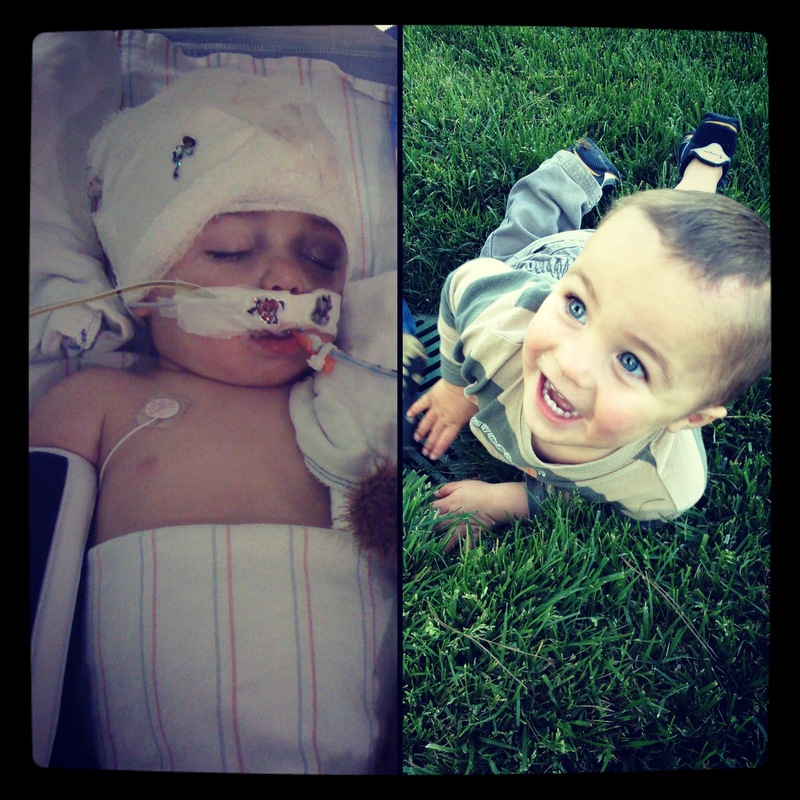 As a mom of three boys, my heart went out to you. I read all of the Facebook updates and prayed for a miracle. I am so glad Simon is better. Thank you, Lord. I started sobbing at the part when you got the news from the doctor. I’m so glad this story has a happy ending!